This pretty fountain is the perfect centerpiece for smaller events. These smaller fountains are the perfect pair for small weddings and intimate events! A beautiful accent to your dessert or cake table. This gorgeous fountain is an elegant addition to any event. Ideal for both small & large gatherings. This is one of our most popular packages. This is our most popular package. Try all three of our mouthwatering chocolate flavors – milk, white, and dark! This is a crowd pleaser! 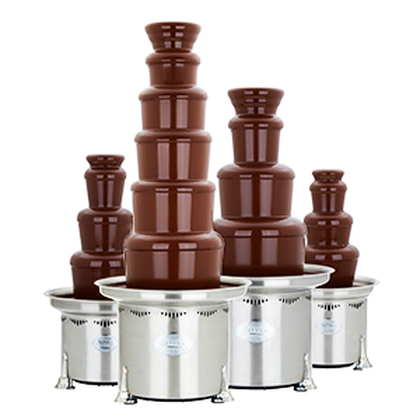 This impressive fountain towers over the competition offering over three vertical feet of dipping area and it is sure to draw a crowd. An unforgettable display! This memorable display is perfect for large crowds. Offering all three chocolate options and a large variety of dipping options. Something for everyone! A signed contract and $200.00 non-refundable deposit is required to secure event date. Balance of contract is due no later than two (2) weeks before event date.